It’s a birthday party with a great double bill, just $20! 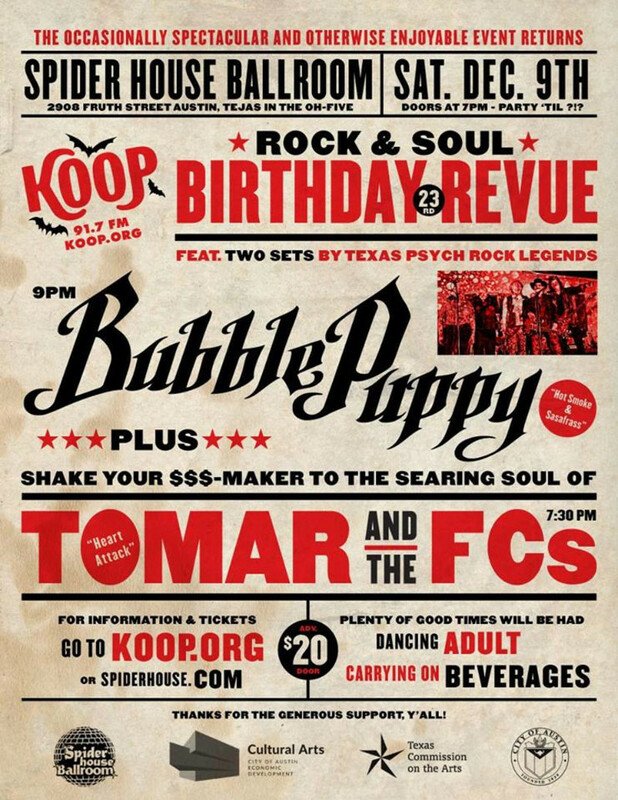 Austin’s own KOOP Radio is celebrating its 23rd birthday with our annual benefit, a concert celebrating independent listener-supported radio, and we’re doing it with two great bands: Tomar and the FCs and the legendary Bubble Puppy! Tomar and the FCs are one of Austin’s fastest rising bands, a high-energy soulful unit with a Sam Cooke spirit and a James Brown passion. Just ask anyone who saw them at this year’s Austin City Limits Festival! Bubble Puppy’s “Hot Smoke and Sassafras” was cool enough a psychedelic rock and roll hit that it even caught the attention of George Harrison, who wanted to get it out on the Beatles’ Apple label. It did just fine anyway, rocking its way into music history. That song was just the beginning for this legendary Texas band. And KOOP Radio is your community radio station, the only cooperative of its kind in the country, programmed by volunteers and providing a wide array of musical programs and news/information programs. This important community resource needs your support to keep it going. Here’s a gloriously fun way to support KOOP!